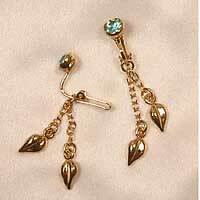 Non-piercing labia clips with crystal, pair, in Gold. Non-piercing labia rings with pendant in Gold. Pair. Women's "Siren"waist band with clitoral pendant-Gold. Women's 'clitoral outline' waist band in Gold with jewels. Women's butterfly waist band with saphire clitoral pendant-Gold. Women's waist band with clitoral pendant-Silver. Women's waist band with Gold & insertable crystal orb.